India’s nationalist opposition party taking leaf from Atal Bihari Vajpayee’s book to attract minority Muslim voters. Lucknow, Uttar Pradesh – “If you have to change the fortunes of India, it must begin in Lucknow,” Narendra Modi, the opposition prime ministerial candidate, said at an election rally early in March. His statement reaffirmed a popular saying in Indian politics: The road to New Delhi passes via Lucknow, the capital of India’s most populous and politically most important state – Uttar Pradesh. As the city goes to polls on April 30, the attention is on the constituency’s Muslims, who comprise about 22 percent of the 1.9 million voting population here. The right-wing Hindu nationalist Bharatiya Janata Party (BJP), which has remained a force here for decades, is making every symbolic gesture to attract the minority voters. 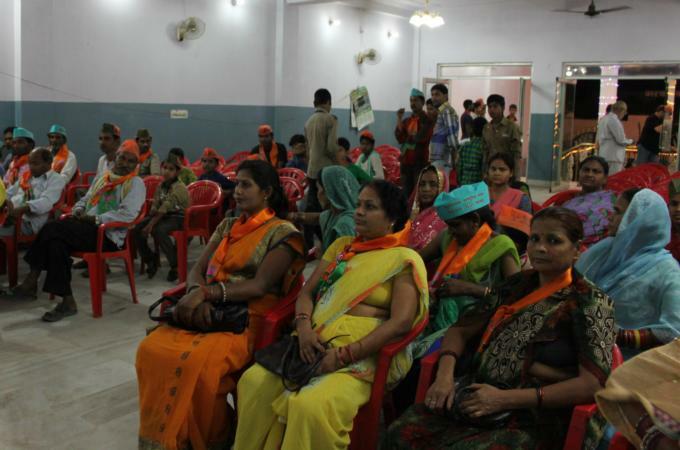 A week shy of Lucknow’s voting day, the Nayab Palace Banquet Hall, located in the heart of a Shia neighborhood in Old Lucknow, was brimming with locals wearing hats and stoles coloured with saffron and green – the colours of the BJP. The event was sponsored by two Shia groups to garner support for the party. Manzoor Hussein, 35, was standing in the back of the room with his arms folded as the main speaker prompted the crowd to shout “Zindabad” (Long Live). The Shia Muslim said he had always supported the BJP, and was staying with the party because of price hikes. 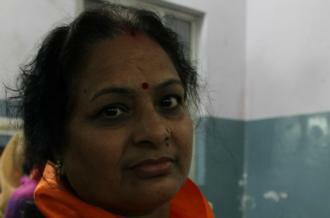 Kanti Devi Purana Pandareeba, 49, sitting in the front of the room with her two friends, was not part of the event’s target population. She and her two friends are Hindu. “The crowd here is mixed,” she said. Lucknow is known both for its composite culture and Muslim culture, as the city was the capital of Awadh rulers during the Muslim Mughal rule. Unlike other incidents of communal violence between Hindus and Muslims, religious violence in Lucknow has generally been confined within the community. Tensions between Sunnis and Shias in Lucknow became prominent in the late 1960s, when violence between the two groups created divisions that never fully rectified, said Nadeem Hasnain, a professor of social anthropology at Lucknow University and a Lucknow native. Political parties then began to exploit this polarisation. Political parties tend to court votes under the assumption that all Muslims vote as one bloc. Furthermore, if any Muslims leaned towards the BJP, they would likely be Shia Muslims. Hasnain said this history is important for its “propaganda” value. “The BJP has been trying to strengthen this idea that the Shias are behind them to increase the divide between Shias and Sunnis,” he said. Others say that the “Muslim voting bloc” is a myth. Muslims, just like other groups in India, vote on the basis of bread and butter issues. “This is a canard that Shias are supporting the BJP,” said Ibne Hasan, 77, a Shia Muslim who has lived in Lucknow since 1952. In Uttar Pradesh, where caste divisions are still prominent forces in the community, voting on the basis of class and caste is also a factor. Data from the 2009 general elections show that Muslim voting patterns in Uttar Pradesh are driven by a caste-class phenomenon. According to a study by the Delhi-based Centre for the Study of Developing Societies, the percentage of Muslims who supported the BJP in 2009 was tiny – six percent. Other votes were fairly spread out between the other major political parties in the state, the Congress Party, the Bahujan Samaj Party and the Samajwadi Party. Contrary to that, politicians cutting across party lines have tried to woo Muslim religious leaders. Rajnath Singh, the president of the BJP and the party’s candidate from Lucknow, caused a stir last week when he donned a skullcap and visited prominent Muslim leaders in Lucknow. Maulana Syed Kalbe Jawad, a prominent Shia leader, added to murmurs by endorsing the BJP. “He should have been the proposed prime minister rather than Modi,” Jawad said. Political observers say comparisons between Singh, a former chief minister of Uttar Pradesh, and Vajpayee, who represented Lucknow in parliament, are rising to counter Modi’s hardline Hindu identity. Vajpayee represented a more secular face of the BJP. Now Singh too wants to transform his image into a softer one. Maulana Kalbe Jawad’s endorsement may influence some Muslims, but it would be microscopic, said Zafaryab Jilani, a lawyer at Lucknow’s High Court and leader of the Babri Masjid Action Committee, a group representing Muslims on the case of the destroyed mosque in Ayodhya. “Within the Shia community in Lucknow, about 25 percent of Shias may heed upon his advice,” Jilani said. Indeed, according to Nadeem Hasnain, the professor of social anthropology at Lucknow University, the BJP’s demonstrative effects are probably more for secular Hindus. This piece was originally published on April 29, 2014, on Al Jazeera English.